Machinist Member wins Young Leader of the Year award! 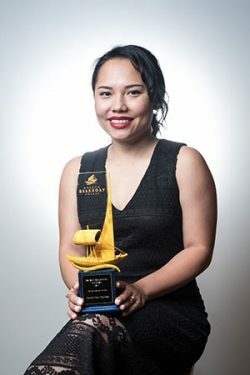 Toronto, ON – UFCW Canada National Representative and IAM Local Lodge 1922 member, Zenne May Maceda has received the Young Leader of the Year award at the augural Gold Balangay Awards, held in Toronto. Organized by a number of Filipino community groups, businesses, and non-profit organizations, the awards show was established to celebrate Filipino Canadians who have made a positive impact in their community or field of work. It recognized Sister Maceda as the 2017 Young Leader of the Year for her outstanding efforts in promoting social justice and workers’ rights as a labour activist.